The near-limitless power of the 2017 GMC Sierra 2500 fuels its herculean performance. 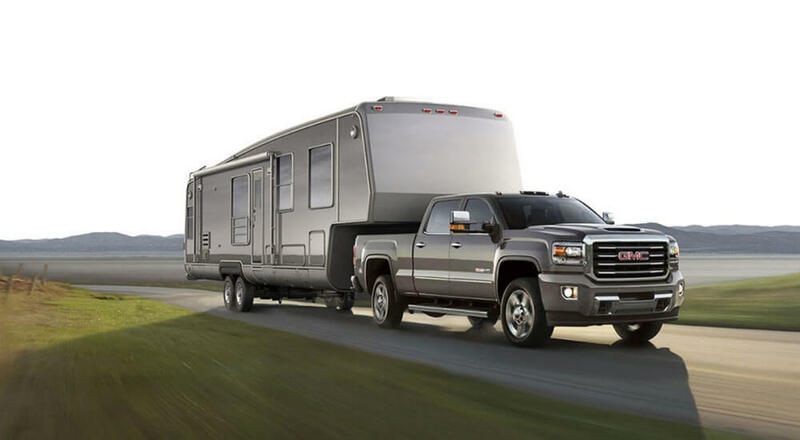 With two V8 engines lurking beneath the hood and a body forged from innovative engineering and performance upgrades, the new Sierra 2500 is a truck that pushes beyond the exceptional. Vortec 6.0L Variable Valve Timing V8 SFI: It speaks volumes when the 2017 GMC Sierra 2500 fits a V8 engine as standard. Variable Valve Timing (VVT) optimises high-end power and low-end torque, ultimately delivering up to 360 hp and 380 lb-ft of torque. Duramax 6.6L Turbo Diesel V8: This is GMC’s most powerful Duramax diesel ever, capable of up to 445 hp and a near-unfathomable 910 lb-ft of torque. That’s a 12% increase in horsepower and 19% increase in torque compared to the engine of the outgoing model. Should you need to travel on rougher terrain or in harsh weather conditions, the 2017 GMC Sierra HD All Terrain Package will align with your needs. Kitted out with all-terrain tires, twin-tube Rancho brand shocks, an underbody shield, and an off-road suspension package with hill descent control, the All Terrain Package totally lives up to its name. It even adopts a bolder grille and distinct badging to lend the Sierra 2500 a more aggressive air. Duramax-equipped models go a step further with noise attenuation elements and combustion improvements for a whisper-quiet drive while cruising or idle, plus a larger radiator for faster powertrain cooling. The 2017 GMC Sierra 2500 achieves feats many other trucks can’t. If you hold any doubts as to its top-tier performance, all you need to do is contact us at Westridge Buick GMC to arrange a test drive. You can also visit us in person at 2406 50th Ave in Lloydminster, AB!